Before I begin, it’s important to realize the least expensive up-front cost to building your own virtual SAN is to do-it-yourself (DIY) using components off the VMware Virtual SAN HCL. This may be a good way to try virtual SAN, but often comes with unforeseen technical challenges. The VMware Virtual SAN Ready Node is a VMware-OEM server vendor validated server configuration in a tested, certified hardware form factor for Virtual SAN deployment. In addition to being jointly validated between VMware and the OEM vendor, many Ready Nodes come pre-loaded with vSphere therefore reducing the time to market. The VMware Virtual Ready Node is not an appliance, but instead a pre-configured, pre-validated bundle ready to run VMware Virtual SAN for users who don’t want to build one themselves but prefer not to use an appliance model. The appliance model, like the VCE VxRail, may be an easier way to get into virtual storage but may be more expensive compared to the DIY or Ready Node options. This is a 4 node all flash VSAN in a single 2U high FX2 chassis offering great density. This configuration allows a total of 8 drives per FC430 via the ‘split’ FD332. This is a 3 node all flash VSAN in 2 x FX2 chassis taking up 4 Rack Units. A 4th node can be added without the overhead of an extra chassis. This allows enough expansion to double the raw capacity and disk groups. Alternatively the disk groups could be split across the two ‘legs’ of each FD332. This is a 3 node all flash VSAN in 2x FX2 chassis and uses 4 Rack Units. Again, a 4th node can be added without the overhead of an extra chassis. This configuration builds one disk group per ‘leg’ of the FD332 controller (using dual PERCs) which should offer significant performance. Boot Device: 6x 16GB SD Card For IDSDM. 2x for each FC630. This blade is 4 socket, but only 2 are used for the initial configuration. 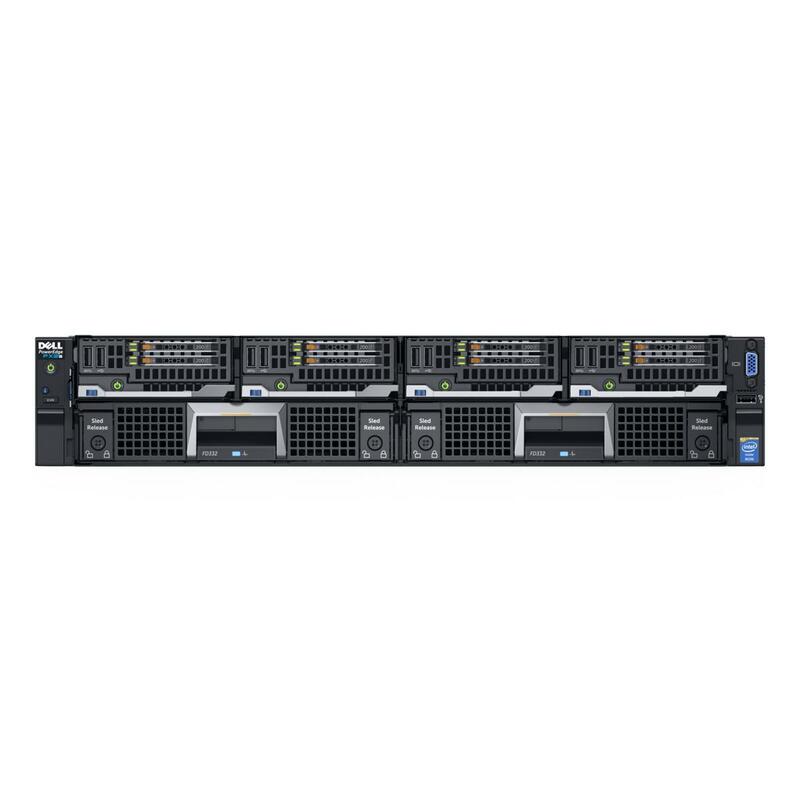 It uses the Dell PowerEdge H730 storage controller to load 8 drives directly onto the blade, rather than using an external controller like the FD332. This is ideal for compute/memory intensive applications that don’t need a huge amount of storage. Again, this is a 2x chassis configuration that can have another identical node added without chassis cost. This configuration takes up 6 Rack Units. Each node is configured with one FD332, but a second could be added without any other chassis. Future CPU capacity can be doubled as well as the RAM. Some people have asked what solution we went with for my customer. We chose to go with the first one (all in 1 chassis.) 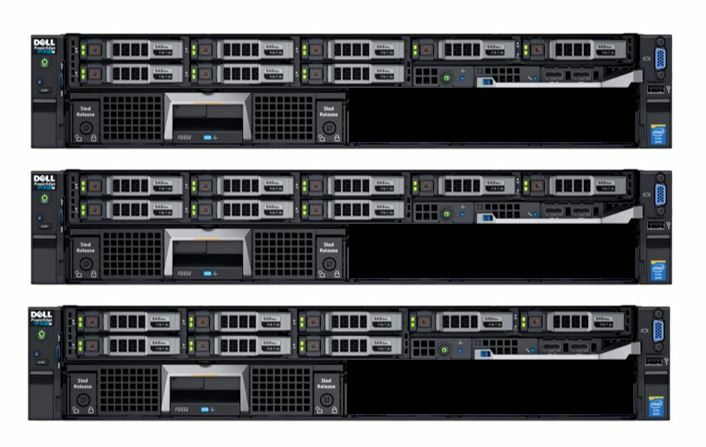 It offers great density with up to 84 compute nodes and 201TB in a single 42U rack. I’d be curious to know which of the above you think would work best for your environments. Leave me a comment below and let me know.